Windows Server 2012 R2 along with System Center 2012 R2 increased agility by making infrastructure easier to deploy and easier to grow and shrink. The key benefits that were highlighted include cost savings with software-defined storage (SDS), improved scale and performance of large workloads with built-in virtualization, and increased agility and mobility with software defined networking (SDN). This paper examines the potential return on investment (ROI) that enterprises with current volume licenses may realise by upgrading to Windows Server 2012 R2 with System Center 2012 R2. 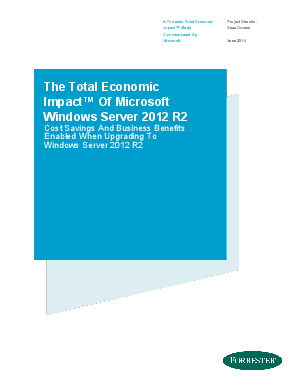 Download now to discover the benefits, costs and risks of using Windows Server 2012 R2.